Due to the winter storm and the shutdown of the streetcar system due to icing of overhead wires, the PCC shuttle today on Kingston Road has been cancelled. 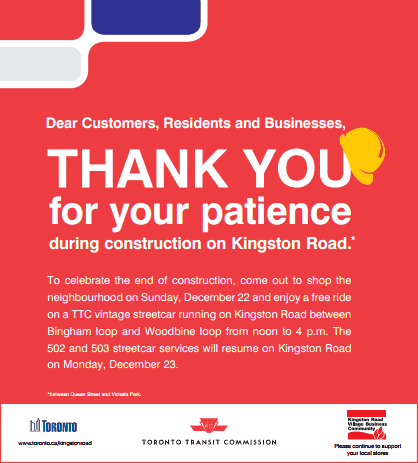 To celebrate the return of streetcar service on Kingston Road on December 23, there will be a PCC shuttle on the line on Sunday, December 22 from noon until 4:00 pm. Service on the 22A Coxwell bus to Bingham Loop will return to bidirectional operation on Kingston Road effective Monday, December 9. Night bus service on 322 Coxwell will return to its standard routing on the morning of Tuesday, December 10. 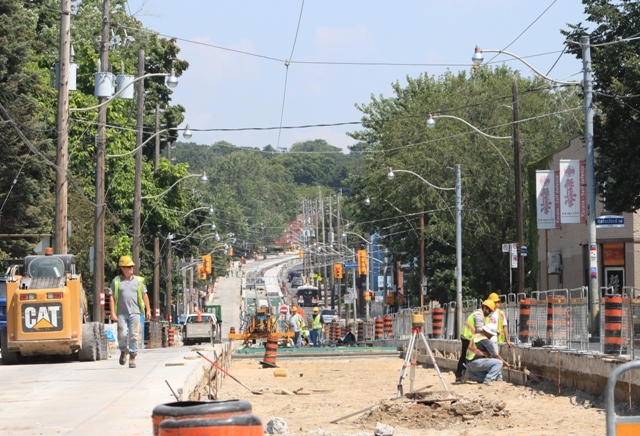 Streetcar service will return to Kingston Road at the next schedule change, and the extra service added to north-south bus routes during the construction period will be removed. This will be effective Sunday, December 22 (buses) and December 23 (streetcars). A side-effect of these changes is that riders in The Beach will no longer have Coxwell buses filling in the common gaps on the Queen car, and the 502/503 cars won’t be available for extended trips east from Woodbine Loop. 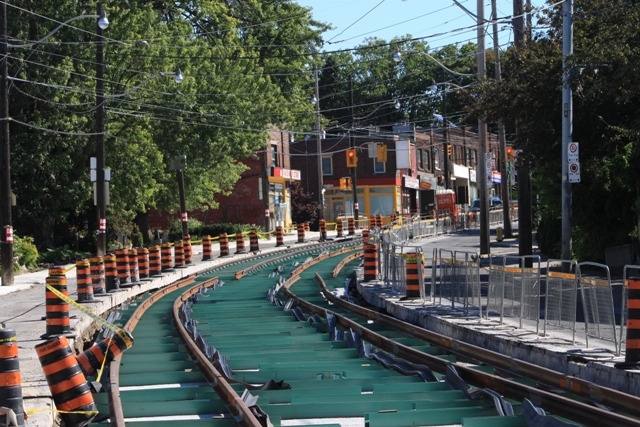 The final stretch of new track is being installed this week on Kingston Road between Lee and Waverley. 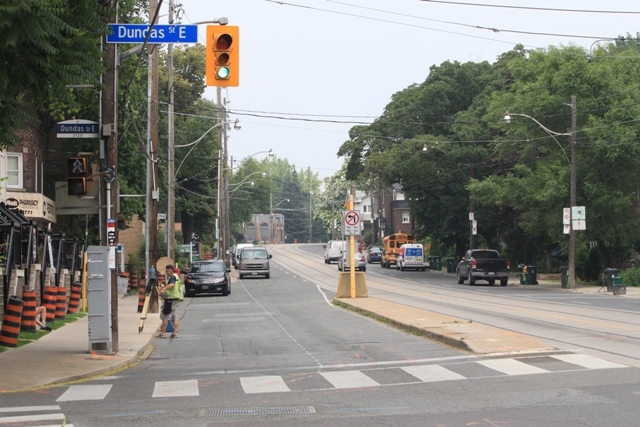 Once the trackwork has been completed, all that will remain will be road and sidewalk repairs in this area, and completion of roadwork in the section between Dundas Street and Woodbine Loop. Looking west toward Waverley Road on November 13. Looking east at Waverley Road. The crew is cutting the new rails to match up with the track that was installed in an earlier phase of the project. Streetcar service is scheduled to return on Monday, December 23. 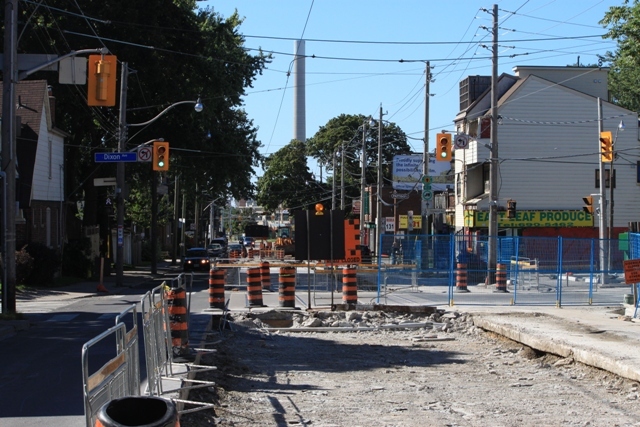 With the amount of roadwork remaining, it is likely that Kingston Road will reopen to bidirectional traffic over its full length before that date, and the 22A Coxwell service may revert to its standard routing bothways to Bingham Loop at some point before the streetcars return. New track assembly is in progress from west of Main to Lee Avenue, and roadbed demolition is in progress from there to east of Waverley. Sidewalk repairs and road repaving continues in the section from Main to Woodbine Loop. Looking west from Glen Stewart to Lee Avenue with the welding crew. The only track remaining to be replaced is in the section from west of Main Street to east of Waverley Road. Demolition of the old track structure began earlier this week. West of Waverley Road to Woodbine Loop, road and sidewalk reconstruction is in various stages of completion, as is the section east of Main Street to Beech Avenue. From Beech to Victoria Park has been completed. 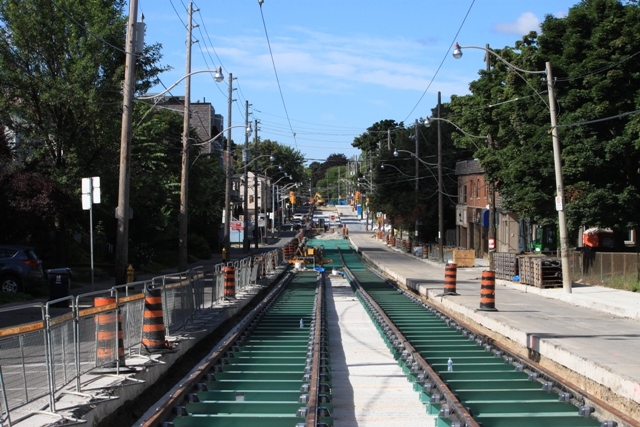 On the western segment of the project, concrete work was almost complete on the track west to Woodbine Loop. Within the loop itself, the track was realigned and laid in concrete in late August, and now the long-disused tail track has been removed. The only remnant is its trailing point switch preserved in the new concrete. Formwork in place for the new concrete on August 23. This is one of the rare instances in recent years of track work proceeding while in active use. The remains of the tail track on October 10. On the eastern part of the project, no track work has started in the last section from Main to Waverley because the intersection at Main is undergoing major reconstruction. 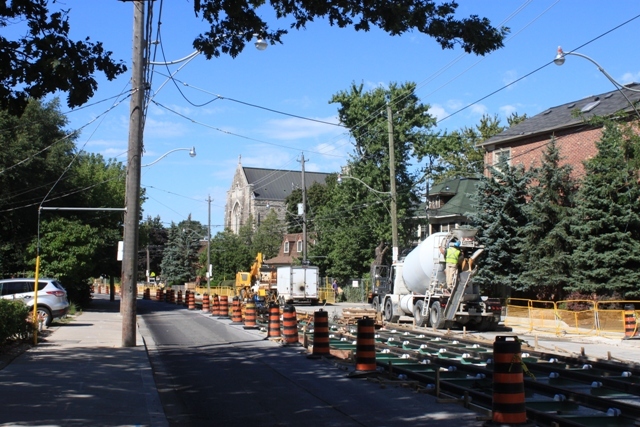 Road and sidewalk work is in various stages of completion over the length of the project from Victoria Park to Queen on the north/westbound half of the street. 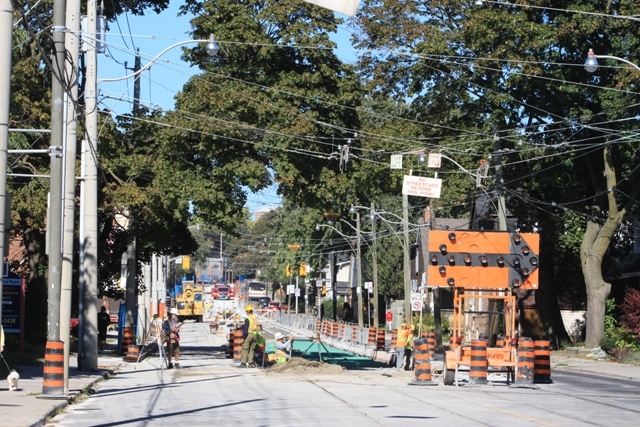 The south/eastbound half will follow the completion of trackwork in the area from Queen north and east to Beech. 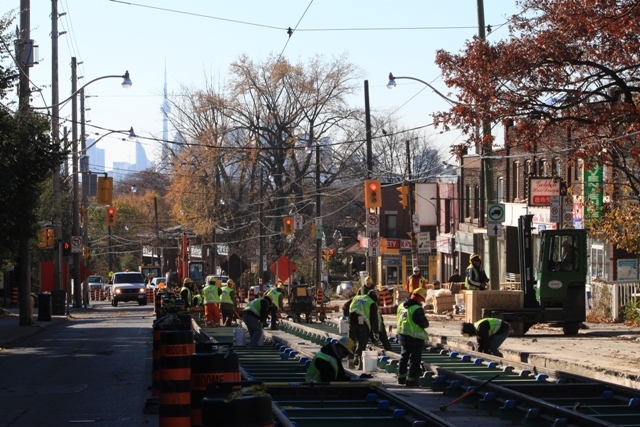 The TTC schedule changes for December 22 include the restoration of streetcar service on Kingston Road and the removal of all extra bus service added on north-south routes to compensate for the absence of two-way streetcar service. On the western segment of the project, track construction is in various stages of completion all the way to just east of Woodbine Loop, the limit of the project. On the eastern segment, track is completed to Main Street and reconstruction of curb lanes and sidewalks is in progress between Main and Beech (the limits of the Phase II of this work). What remains is reconstruction from west of Main to east of Waverley. 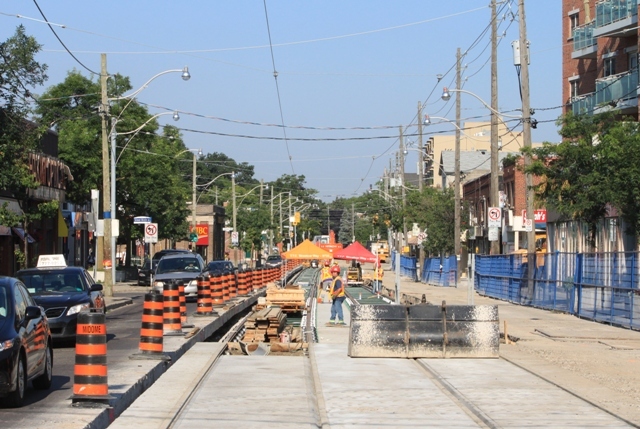 Updated September 14, 2013 at 4:40 pm: On the western segment of the project, construction has crossed Dundas Street and is nearing the west end of its scope. On the eastern segment, Phase II of the track work is nearing completion with the reconstruction of the intersection at Main now underway. Sidewalk and road paving work in this segment will be completed once buses can be shifted onto the streetcar lanes. Updated September 5, 2013 at 9:45 am: On the western segment of the project, demolition of the Waverley intersection at the east end of previous construction was underway on September 4. Paving of the westbound curb lane is in progress between Waverley and Woodbine. 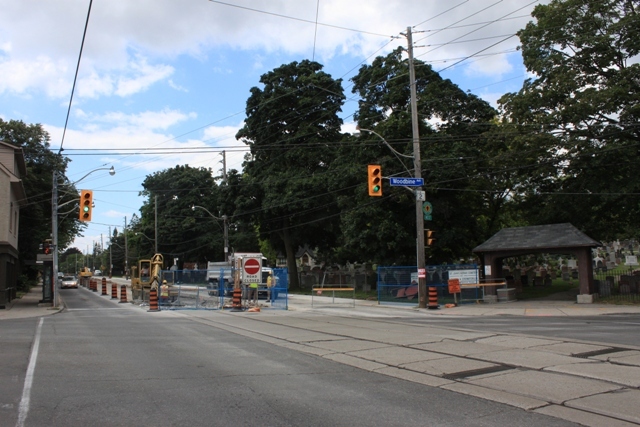 The intersection at Woodbine was rebuilt over the Labour Day weekend. 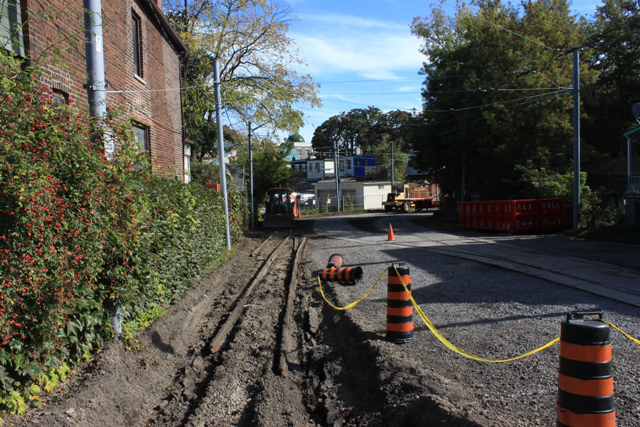 Track construction is at varying stages west from Rainsford around the corner toward Dundas Street. On the eastern segment, Phase II (Beech to Main) is well underway with demolition in progress to just east of Main Street. New track is in various stages from Beech west to Glen Manor. Updated August 26, 2013 at 9:25 am: On the western segment of the project, right-of-way preparation has reached Columbine. 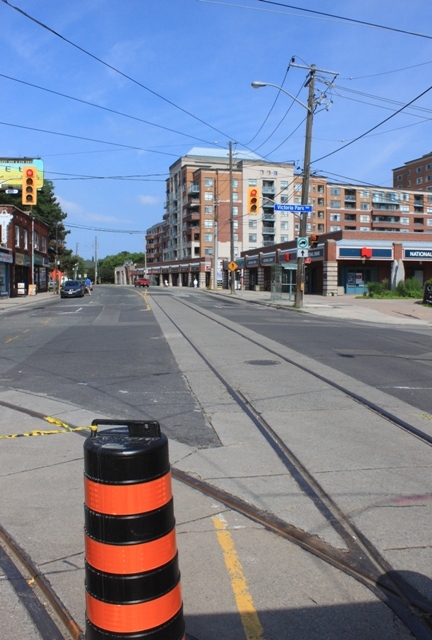 The intersection of Woodbine and Kingston Road will be rebuilt over Labour Day weekend. 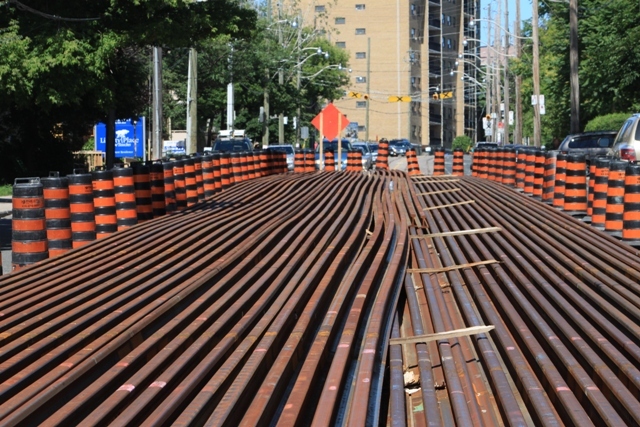 The eastern segment is completed from Victoria Park to Pickering, and construction is underway on the second phase (Pickering to west of Main) to Hanniford. Sidewalk reconstruction is already finished on the north side to Main, and on the south side for about half way back to Pickering/Beech. Updated August 16, 2013 at 4:30 pm: On the western segment of the project, track assembly is in various stages of completion to Rainsford, and the excavation is complete to the west end of St. John’s Norway Cemetery. This appears to be a point where work will pause before continuing west and south to Queen, although some of the sidewalk work has already been completed notably at Dundas Street. 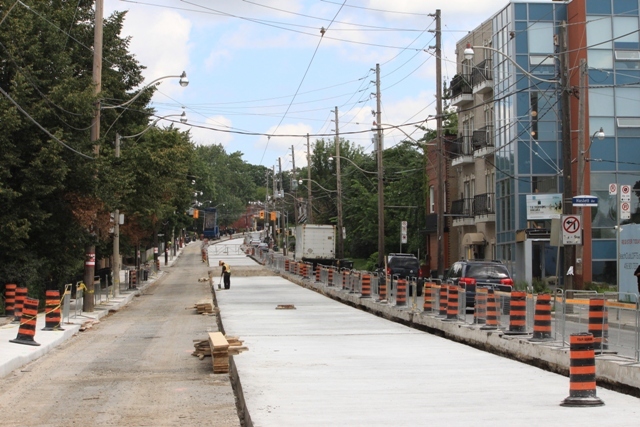 The eastern segment has almost completed its first phase west from Victoria Park to Beech Avenue with final paving of the curb lanes in progress today. Some sidewalk work has begun on the north side west from Beech for the second phase of the project. 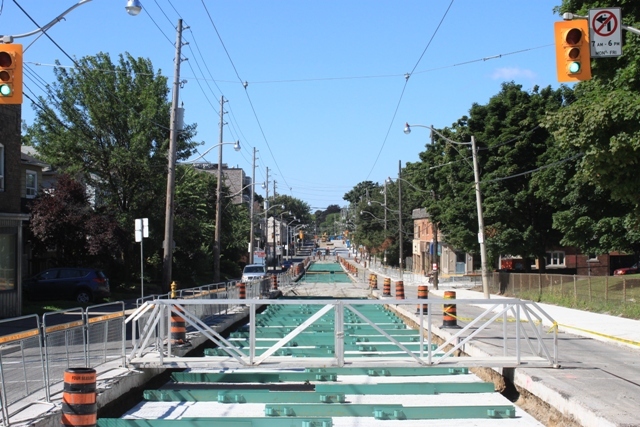 Updated August 10, 2013 at 1:45 pm: On the western segment of the project track assembly continues west to Woodbine. The foundation slab has been poured west to Rainsford, and the street excavation is completed to almost the west end of St. John’s Norway Cemetery. On the eastern segment, Kingston Road has reopened at Victoria Park. Paving of the curb lanes is in progress west to Beech/Pickering, the limit of the first stage of work. Updated August 3, 2013 at 11:20 pm: On the western segment of the project, track assembly is underway between Waverley and Woodbine. 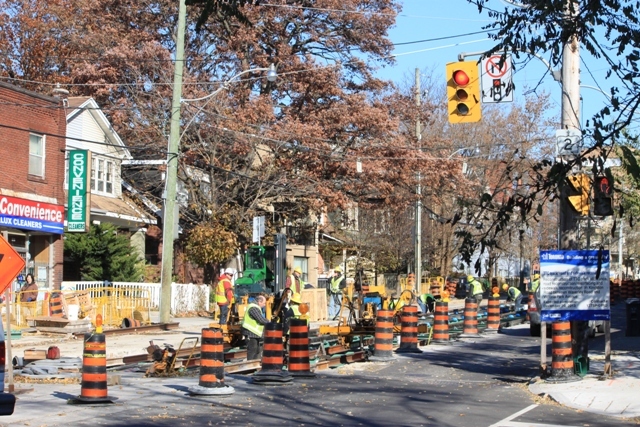 On the eastern segment, the intersection at Victoria Park is closed for reconstruction and a new east-to-north curve is being installed. Updated July 30, 2013 at 3:15 pm: On the western segment of the project, the foundation slab is in place west from Waverley Road to Woodbine Avenue. 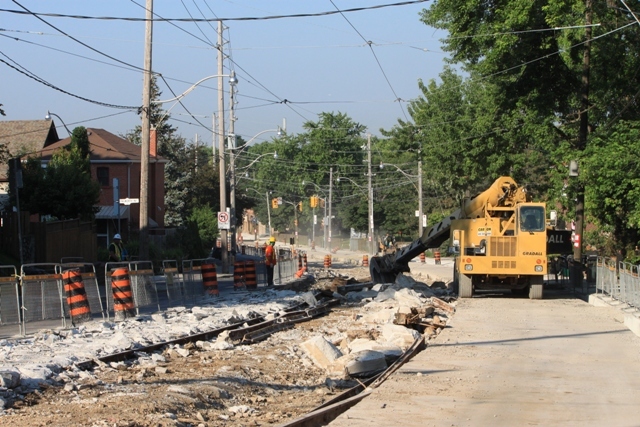 Demolition of the trackbed is in progress from Woodbine west to Rainsford Road. No track has been laid in this section yet. 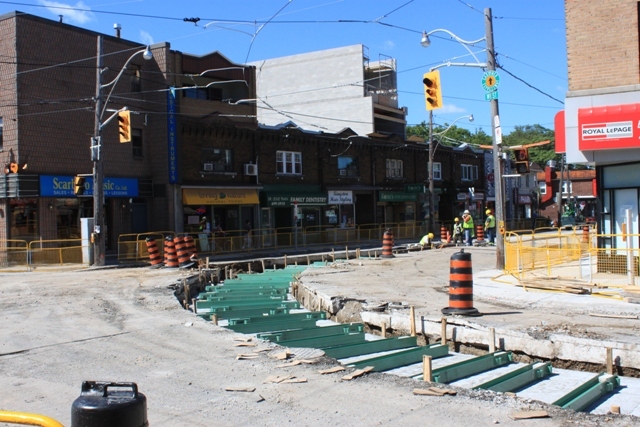 Reconstruction of the north/west sidewalk is well underway including the reconfiguration of the westbound stop at Dundas. 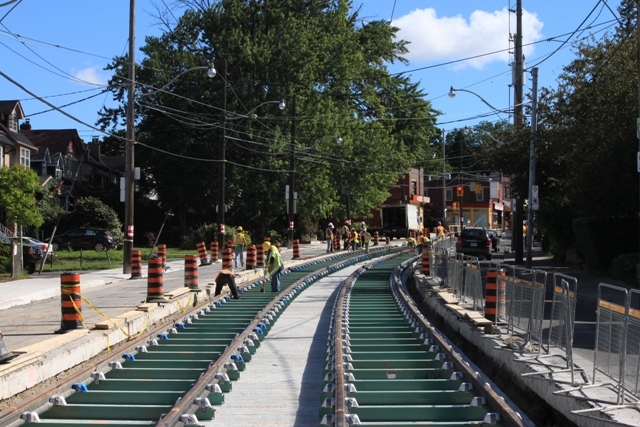 On the eastern segment of the project, new track is complete from Victoria Park to just west of Balsam Avenue. The exit curves from Bingham to Kingston Road are being installed, and the curves at Victoria Park are scheduled for work at that intersection beginning August 2. 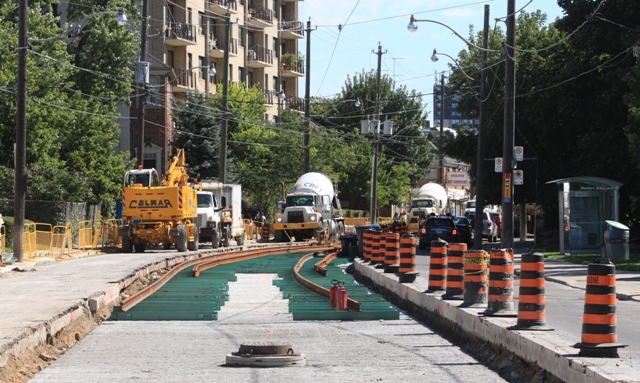 Buses are now running on the completed streetcar lanes while the curb lanes are repaved, and both the north and south sidewalks are in various stages of reconstruction. Photos of work in progress have been added. 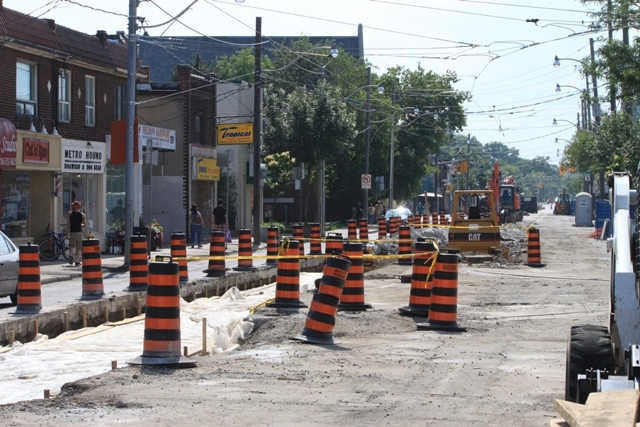 Updated July 17, 2013 at 11:30 pm: Photos of work in progress on Kingston Road have been added. Updated July 3, 2013 at 11:55 pm: John F. Bromley, whose comments about Bingham Loop and the West Hill radial were included in Update 1, has now supplied a detailed track map for the 1928 configuration. This info has been added to the section with his earlier remarks. Updated July 2, 2013 at 5:35 pm: In the comment thread, there was a mention of the changes to the intersection at Dundas and Kingston Road, westbound, where the safety island (which is too small for accessibility needs) will be removed and the sidewalk extended to continue the street at a standard width. An illustration of this has been added to the article. 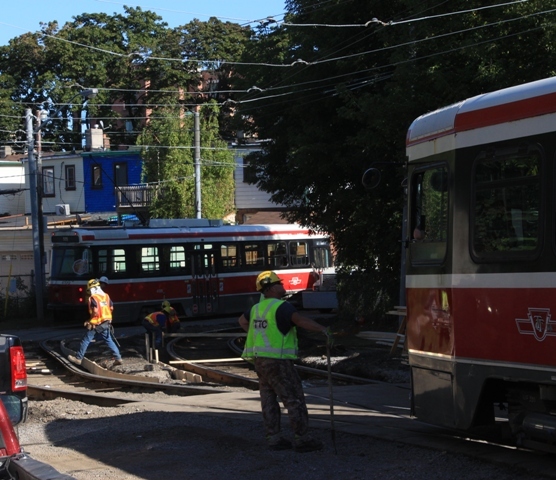 Updated July 1, 2013 at 1:15 pm: In the original article, the south-to-east curve at Bingham and Kingston Road was described as a route for outbound radial cars turning back from Victoria Park. John F. Bromley advised by email (included at the end of the article) that this was not the case, and that the cars reversed in a different manner for their eastbound trips. 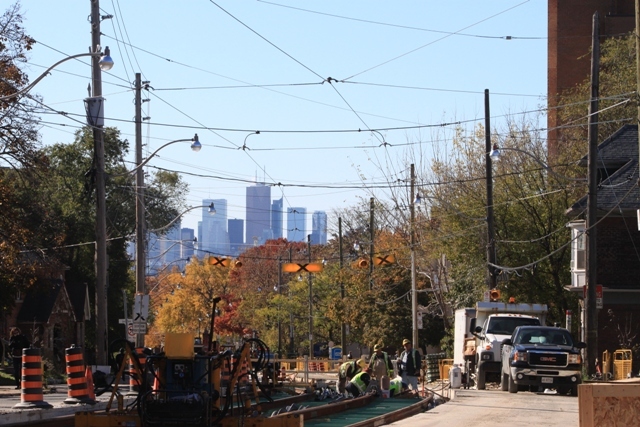 The reconstruction of Kingston Road from Queen Street to Victoria Park will bring the final piece of “main line” streetcar trackage in Toronto up to a new construction standard begun twenty years ago. Work started early in June 2013 with delivery of track and pre-welding into long “strings” to speed installation. Looking west across the intersection at Dundas toward Queen. The foundation slab is in place from Dundas to Lark. Looking east from Dundas & Kingston Road toward Columbine. Looking west across the intersection at Main/Southwood. Looking west at Malvern Avenue. Looking east to Malvern Avenue. Two views looking east at Rainsford Road. Looking west from Elmer toward Woodbine. Looking east toward Waverley from Elmer. 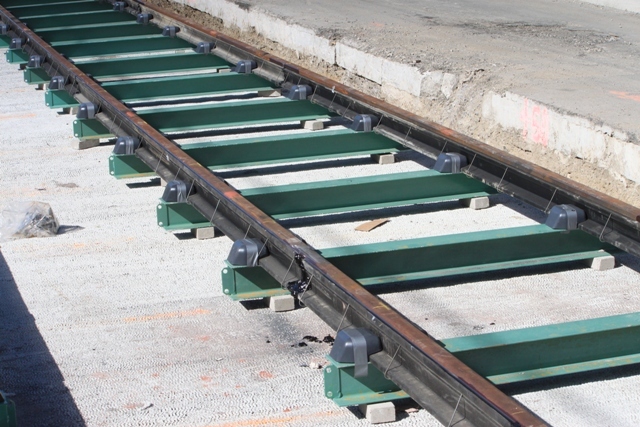 An example of the assembled track, ties and foundation before the upper two layers of concrete have been poured. Looking west from Elmer and Kingston Road toward Woodbine Avenue. Looking east toward Waverley Road. Preparing for the new east-to-north curve at Victoria Park. The new curve south to west at Bingham and Kingston Road. Looking east from Woodbine Avenue on Kingston Road up the hill to Waverley Road. Looking west from Woodbine on Kingston Road. Track across this intersection will be replaced in a weekend shutdown at a date yet to be announced. Construction on both contracts for Kingston Road is underway. 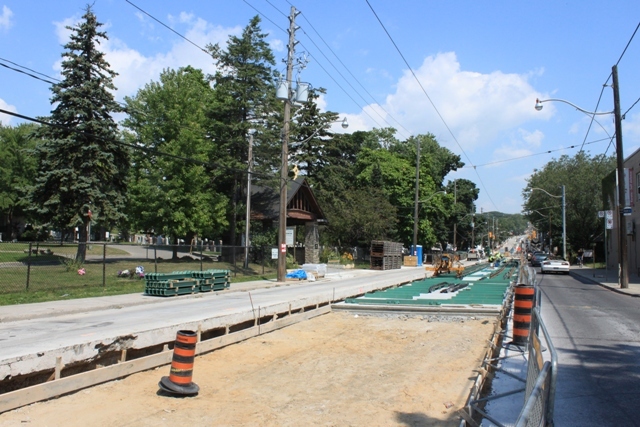 The north sidewalks have been rebuilt for some distance west of the starting points (Victoria Park and Waverley respectively), with track construction following behind. Looking west from Waverley and Kingston Road, south side. This type of small convenience store in an otherwise residential building is a common feature of Toronto streets. Looking west from Waverley on the north side. Demolition of the old track extends some distance, and not far beyond the point where debris is being removed, the roadbed is already prepared to receive the foundation layer of concrete. The existing track does not have rubber sleeves, and was set in concrete which has been badly broken in places by vibration. On the eastern contract, new rail is in place west to Balsam Ave. with most of the concrete completed to Silver Birch Ave. The curves for Bingham Loop from Kingston Road have not yet been placed. According to the Construction Notice, this will be done on the August 3-5 long weekend. Two inventories now occupy the centre of Kingston Road, one between Woodbine Loop and Dundas Street, and the other just east of Waverley Road (below). 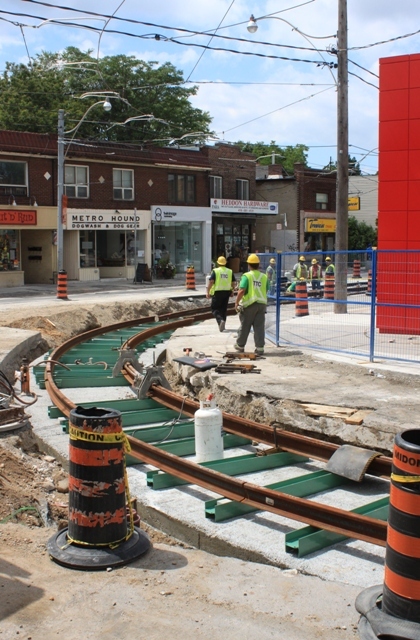 Project details including route changes are on the TTC’s website and on the city’s Kingston Road project website. The display boards from the public open house give a more detailed view of work plans and some of the changes coming to the street including the creation of a new parkette at Dundas. The westbound safety island at that location (the only one on this section of the network) will be removed. Because of the length of work involved (3km), the project has been broken into two segments with Waverley Road as the dividing line. As of June 30, there is no construction activity yet on the west segment. In the eastern half, work began at Victoria Park and will progress westward. 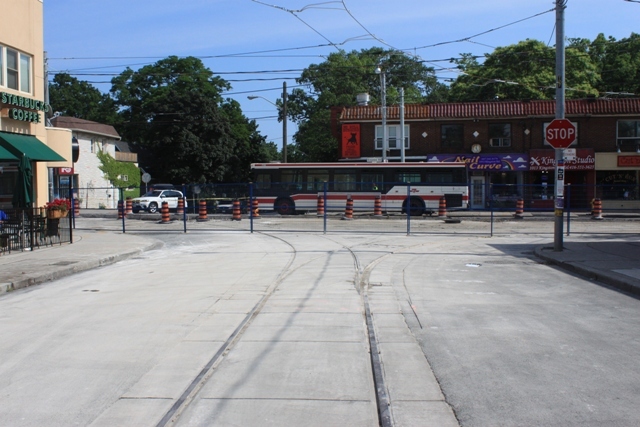 Bingham Loop will be altered by the removal of the tail track east of the intersection (the only remnant of streetcars in Scarborough) and the runaround track. Looking west to Bingham Ave. The foundation slab for the eastbound track is already in place, and demolition of the old track has progressed to Kingswood Road. Looking south on Bingham to Kingston Road. 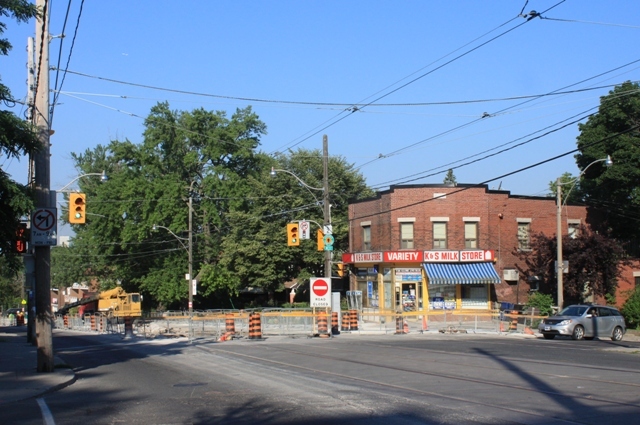 The Coxwell 22A bus provides one-way service here during construction, and operates south to Queen via Blantyre where streetcars brought summer visitors to “Victoria Park” (where the water works now stands) in the early days of this line. The turn to the left (east) is the loop’s runaround track, originally for the radial cars running east from Bingham Loop. In recent years, the curve was rarely used except by charter trips and it will be removed. The new pantograph-compliant overhead includes only the south-to-west curve. Looking east across the Victoria Park intersection showing the tail track into Scarborough. In the distance, to the right of the end of the tail track, is an historic plaque on the corner of the National Bank branch. Once the tail track disappears, the relevance of the plaque’s location will be a mystery to future visitors. 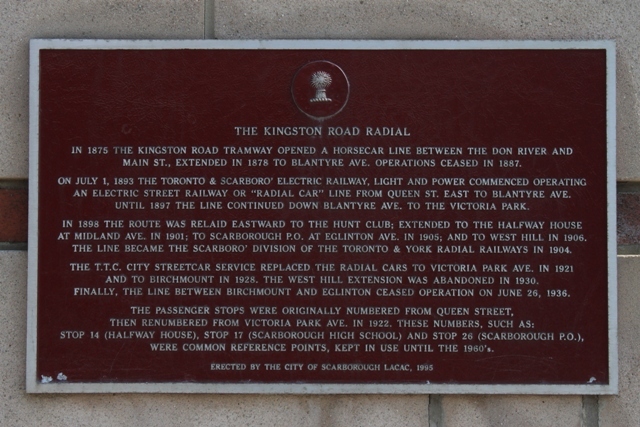 This plaque provides details of the evolution and eventual removal of streetcar service from Kingston Road in Scarborough. It does not include the cutback of streetcar service from Birchmount Loop to Bingham Loop on July 1, 1954 (to the boundary of the City of Toronto, also the end of fare zone 1). 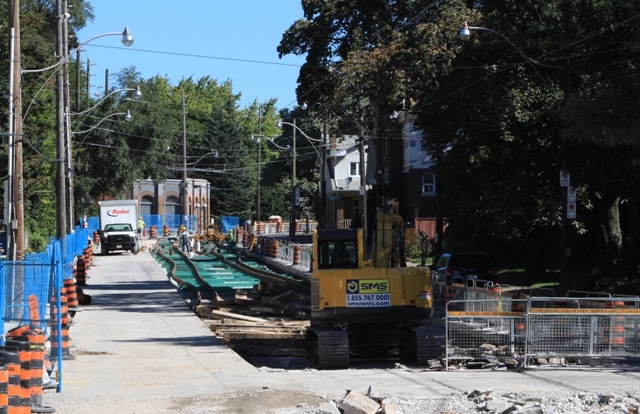 The track to Birchmount Loop was paved under in 1955, but will no doubt emerge again during a separate road construction project east of Victoria Park this year. Updated: The following information was provided by John F. Bromley. Radial cars did not reverse using Bingham loop. TTC operation began January 12 1927 and SCARBORO operated from the new off-street Victoria park Terminal, completed on January 25, 1927 just east of Victoria Park and parallel to it (previously reversed on the street on the east side of Victoria park). For carhouse runs, the new terminal was accessed/de-accessed as follows. Cars entering service from Russell Carhouse operated via Kingston Rd and Victoria Park to a point just north of a newly-laid Victoria Park Terminal access track located a bit south of Meadow Av and briefly parallel to it, then reversing into the terminal, loaded, and then ran east over the normal route. Cars leaving service operated west on the access track, north on Victoria Park into and through Bingham Loop, turning west again on Kingston Rd. During the construction of the extension to Birchmount, access to Victoria Park Terminal was cut off once the new TTC rails were laid. During that period, SCARBORO cars used the north (westbound) new rails in both directions, with a temporary connection at Birchmount. With this change, the route was accessed from Russell via Kingston Rd, Victoria Park, through Bingham Loop, south on Bingham and west (briefly) on Kingston Rd, then reversing east across Bingham via Kingston Rd using the new westbound trackage, then boarded passengers on the street on the east side of Victoria Park outside the old Victoria Park Terminal. Earlier historians had thought SCARBORO used the south (eastbound) track during the construction, but the north (westbound) track was later found to have been laid first during an exhaustive search by Ray Corley when he was updating his Scarborough Township historical material. 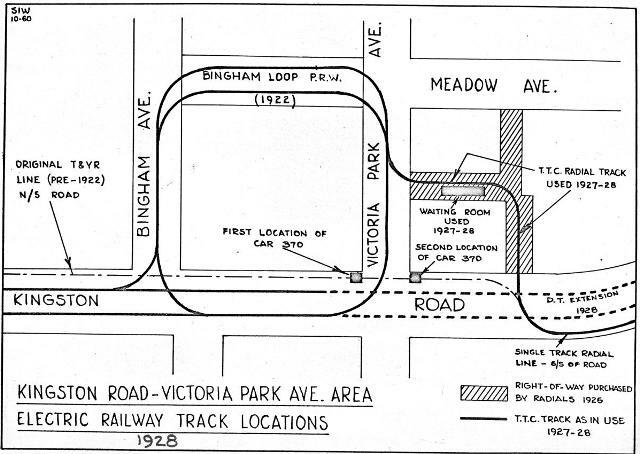 John F. Bromley has provided further information about the arrangement at Victoria Park and Kingston Road where cars from the TTC system met the radial line to West Hill. SCARBORO transferred to the westbound extension track when it was completed to Bingham so that work could be finished on the eastbound track. The map was drawn by Stu Westland in 1960 for Ray Corley, based on Corley research. The waiting shelter built from the body of TRC 370 was the original end of the line prior to the opening of Victoria Park Terminal. Stu showed the body right on the car tracks but of course it wasn’t, being at the curb instead. Westbound at Dundas is the only safety island on this branch of the network. It is too narrow for accessibility and, rather than widening it, the TTC will remove the island. The sidewalk will be extended to match the nearby street line so that this stop has the same configuration as all others on Kingston Road. In the photo below, the thin dotted line on the pavement shows the new curb location. Were any extra cars run at night when the icing started? All night service is so infrequent the ice got ahead of them and they could not recover. That is my guess. Seems everybody forgets what to do whenever something unusual happens. Winter comes every year even with global warming. Be prepared and then take ACTION. Remember, it wasn’t raining when Noah built the ark! I suspect that even extra cars with sleet cutters wouldn’t have helped after trees started falling on the roads and the wires.